An easy, elegant dinner tonight: pan-grilled New York strip steaks with roasted garlic bread and a salad. Because the main course was so straightforward, I decided to have a bit of fun with the salad. I never seem to be able to find goat cheese in larger than a 4-oz log, so it is a good thing there are only two of us. I sliced off 4 medallions of cheese, squeezing the broken bits back together, and dipped them in a bit of egg white and then seasoned bread crumbs. They waited briefly in the fridge while I got the steaks going and some walnuts toasted. Then I quickly cooked them up in a non-stick skillet while tossing baby spinach with bits of toasted walnut, dried cherries and balsamic vinaigrette. 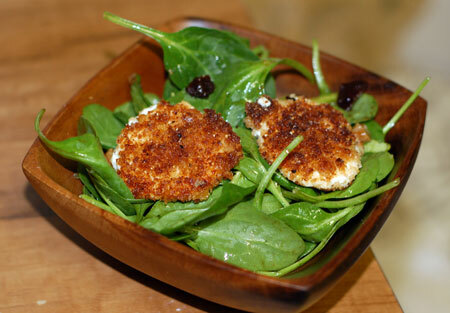 It was delicious and felt well-balanced, and the goat cheese was easier to deal with than I had anticipated. No recipe needed! Thanks, Kalyn! I’ve never made this before, and actually, I’ve never even eaten it at a restaurant, but I was really happy with the outcome. Jeremy has more experience with warm goat cheese salads, and he said it was the best salad he’s had in a while, for what that’s worth.